English landscape and sporting painter. He probably received some instruction from Jan Wyck in the 1690s, and he was possibly patronized from an early age by the aristocratic households of Beaufort and Coventry (as was Wyck), perhaps while working as a page to Lady Anne Somerset at Snitterfield House, Warwicks. His earliest extant dated work is the horse portrait Bonny Black (1711; Belvoir Castle, Leics). By this time he had begun to establish himself in London. 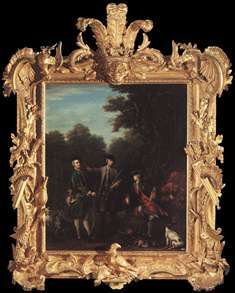 He was a subscriber to the first English Academy of Painting and Drawing in 1711 and by 1717 had been elected a steward of the Virtuosi Club of St Lukes. He specialized very successfully in horse subjects, but his main contribution to British painting was the introduction of the ideal landscape. Horace Walpole said his works in this vein approached towards Gaspar Dughet, and sometimes imitated happily the glow of Claude Lorrain. His landscape manner was continued by his pupil George Lambert. See more details about "The Shooting Party"